Son of Grandmaster Helio Gracie, Royler Gracie is a legend of the sport. His titles and accomplishments as a fighter are numerous and his ability and passion to share his father’s teachings are even greater. 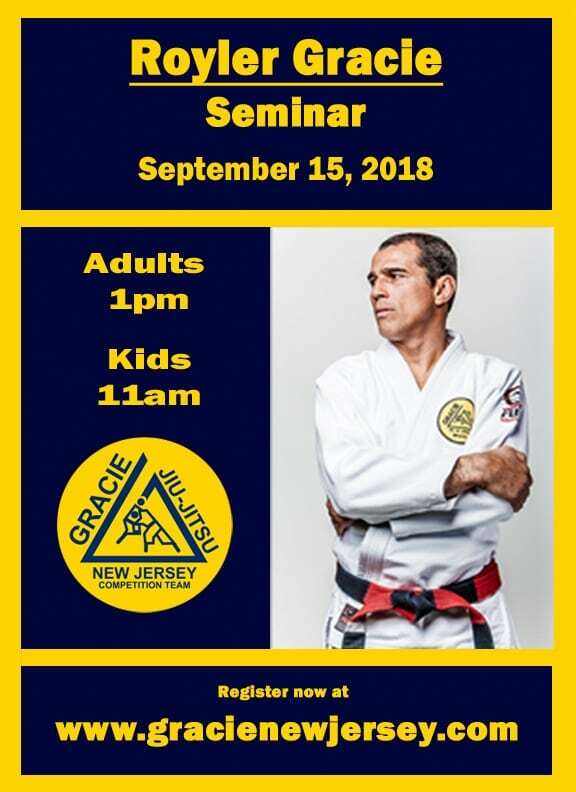 We are fortunate to have him as the technical director of the Gracie Humaita Association, to which the Gracie New Jersey Academy is a proud member. Please join us for this incredible event! – Please be punctual – Arrive earlier to check in and get ready. – Doors will open at 12:30pm for the adults’ seminar and 10:30am for kids’ seminar. – Wear a clean WHITE GI – no other colors will be allowed. – There is NO RECORDING allowed. – Individual and group photos are reserved to the end – you are welcome to bring your own photo camera. – We don’t have a big lobby/sitting area, therefore we cannot accommodate spectators. Please use button below to complete payment. If registering more than one person, please fill out one information form per participant. Payment can be combined in one transaction, simply adjust the quantities on your order summary.